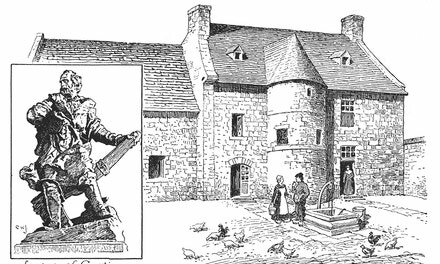 During the winter of 1535-1536, which Cartier's company spent in the neighbourhood of Stadacona (now Quebec), they suffered severely from scurvy, a disease caused by eating too much salt meat, and the lack of fresh fruit and vegetables. Indians, explorers and settlers were afflicted by this disease in the early days of Canada. Cartier's own account says: "In December . . . the sickness broke out among us . . . and spread to such an extent that in the middle of February of . . . our company there were not ten in good health, so that no one could aid the other . . . Our Captain (Cartier) . 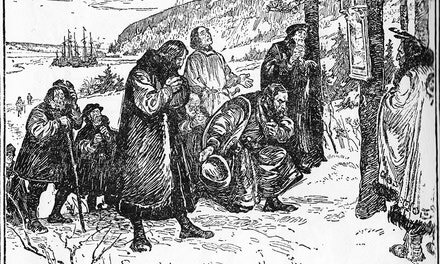 . . gave orders for all to pray, and had an image and figure of the Virgin Mary carried across the ice and snow and placed against a tree about a bow-shot from the fort, and issued an order that on the following Sunday mass should be said at that spot, to which all who could walk, both sick and well, should make their way in a procession, singing the psalms of David with the Litany, praying the Virgin to ... ask her dear son to have pity upon us." By the middle of April twenty-five of the seamen had died, and there was little hope of saving more than forty others, while all the rest were ill excepting three or four. While walking outside the fort one day, Cartier met an Indian named Dom Agaya, whom he had seen ten or twelve days earlier, extremely ill with the same disease from which his men were suffering. He was now well and in good health, and Cartier asked what had cured him. Dom Agaya replied that he had been healed by the juice of the leaves of a tree, and sent two Indian women to gather some of it. 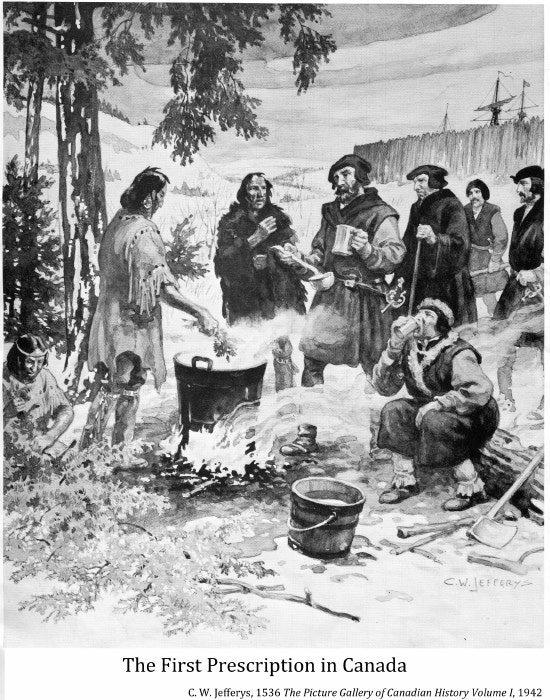 They brought back several branches, and the Indian told Cartier to boil them in water, to drink of it, and to place the dregs on the parts of the body which were swollen and affected. According to Dom Agaya this tree was called Annedda, and cured every disease. The tree was either the hemlock or spruce. Cartier at once had some of it prepared. "As soon as they had drunk it they felt better and after drinking it two or three times all who were willing to use it recovered health and strength."